Imagine a person chasing a terrified puppy across an open field. The puppy is suddenly and brutally clothes-lined by a rope thrown around her neck from behind. Her legs fly out from under her and she falls on her back with a thud. Her attacker grabs her, lifts her up off the ground and body slams her. She would cry out, but she can’t breathe. In shock, the puppy’s legs are quickly tied together so she can’t run from her tormenter; and she is dragged by the neck with the rope. When did the 4th of July become a time to celebrate animal abuse? 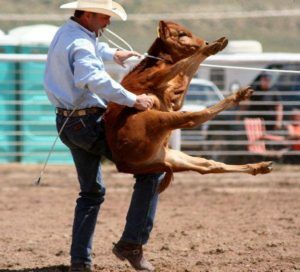 Rodeo animals are generally tame creatures who must be provoked into battle. They live lives filled with stress and fear. Is the Rodeo coming to your town? 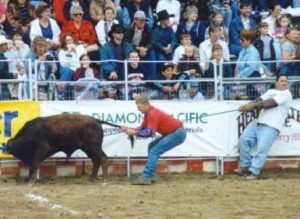 Contestants practice their games on numerous calves, bulls, and horses, injuring and killing many animals before even entering the ring. A contestant’s score is based on how long he can ride a struggling animal or how quickly he can overpower an animal. Sprains, broken bones, muscle pulls, saddle blisters, spur wounds, flank strap wounds, punctured lungs, broken ribs, hematomas, bruising, and broken necks are common. 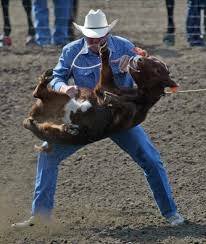 Wounded animals are quickly removed while the rodeo announcer and rodeo clowns distract the public. 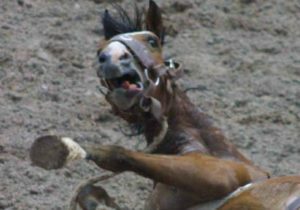 The animals who become too injured to participate are sent to slaughter. 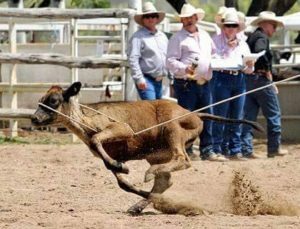 Rodeos are state sanctioned cruelty that must be outlawed! 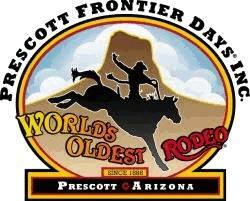 Today is opening day for Prescott Frontier Days considered the World’s Oldest Rodeo. Established in 1888, the event has occurred over every 4th of July weekend for 130 years – and features breath-taking performances that can result in animals suffering broken ribs, backs, and legs, torn tails, punctured lungs, internal organ damage, ripped tendons, torn ligaments, snapped necks, and agonizing deaths. For six years I served as executive director of the Yavapai Humane Society (YHS) – located in Prescott, Arizona – home to the world’s oldest rodeo.